What can I say? I've got restaurants to talk about and recipes to post, but it's hard for me to continue my ex-pat blog when I really just want to re-pat myself. It's not like Argentina lost it's charm - there continue to be many facets of life that I love here - but the gritty bits seem to be taking over the good. I feel like everything and everyone is corrupt. It's second nature to constantly watch your back because you're likely to be taken advantage of at every turn. And I'm glad that I'm not the only one that realizes what a sham it is to live like this. The Argentine Post recently discussed the lack of trust in this country. But when everyone - from the guy who insists that you pay him for 'watching' your car to the president - will jump at the chance to screw you over, it's hard to deal. Why am I so down? Last week Guille was attacked on the street while out for a run. (He's okay now - I'm so glad) But the police wouldn't come and the hospital didn't have any ice to stop the swelling. We've had to get a lawyer in order to get the situation in front of the justice department. You'd think that we're doing the right thing. Trying to have a criminal prosecuted. But people have warned us against doing so. Argentineans are so reluctant to stir the pot that they ignore their best interests and turn a blind eye to the worst injustices. The police will warn you against pressing charges. They'll tell you that the criminal will come after you as soon as they're released from their 2 hour stint in jail. And it's a real travesty of Argentine society that this is allowed to happen. And so, what can I do but go out in search of some sense of normalcy. An Antares brew pub opened in Rosario recently, with good food and tasty beer - though, of course, it isn't without it's hiccups. (I imagine that it's tough to develop continuity in an Argentine restaurant chain.) 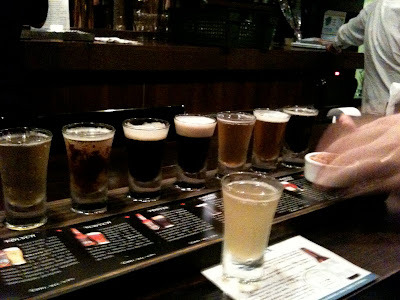 The 18 peso sampler is a fun way to try all 8 brews - you get a shot of each. 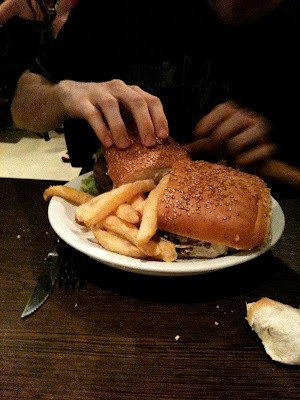 The food is reasonably priced and the sandwiches are huge. 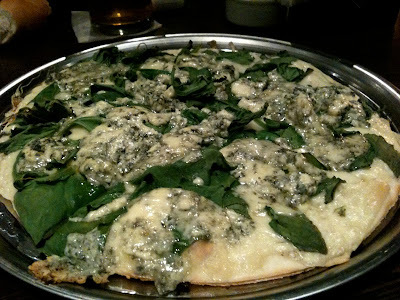 Gui and I ordered a spinach, mushroom, blue cheese pizza. Once we bit into it we realized that it had no mushrooms. We debated whether or not it mattered enough to cause a scene, but I couldn't be screwed over again. We asked the waitress who took the uneaten portion of our pizza back to the kitchen for mushrooms. 10 minutes later she admitted that there were no mushrooms but that someone had gone out in search of such. Right. At 11pm on a Saturday. But she gave us a free cheese plate. Another 10 or 15 minutes later we learned that the search was unsuccessful - would we like to choose something else from the menu for free? No, we just wanted to finish what we'd started. And so we got our re-heated pizza back. 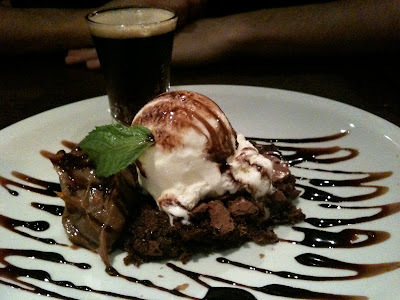 Our waitress insisted that we order something else so we ordered a brownie for dessert - which came with a shot glass of complimenting beer. Nice. Although not quite enough to make up for the sting of reality. I'm exhausted. I hate that everything is a fight, a constant struggle. But I'm glad that someone finally solved the "beer or ice cream? dilemma." One thing at a time. I agree that the inherent lack of trust and the incidence of crime without proper justice are two of the aspects of Argentina that irk me the most. The sad truth is that it's easier to turn a blind eye when one hasn't been personally affected. I'm sorry that you have both been touched by violence, but I hope you can come through this event without feeling too bitter toward Argentina. Big hugs for you both. Thanks to both of you. Our spirits are looking up now, it's just such a crazy society to constantly deal with. But still, always an adventure. Meag - I am so sorry to read your bad news. I hope things turn around soon for you and your hombre. Besos. It's a pisser this country sometimes, isn't it? I sometimes think I got very lucky with my residency and stuff (2000-1) as everyone else had more problems. Stick it out though, it's a great place to live most of the time!